Accept No Substitute, Status Quo are back at The SSE Hydro Glasgow. Status Quo return to Scotland in December for what promises to be another blinding show, bring legendary guitarist Wilko Johnson in support. 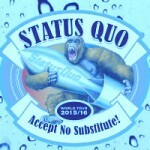 The ‘Accept No Substitute‘ tour is an 11 date run, which will see The Quo hit some of the big arena venues across the UK. With the full line up on the tour of Francis Rossi, Rick Parfitt, Andy Bown, John ‘Rhino’ Edwards and Leon Cave they are promising some rocking shows, following their brief acoustic tour before. Wilko Johnson has been given the all clear following his cancer treatment and will be a brilliant addition to the tour. Rising to fame with legendary pub-rockers Dr Feelgood, Wilko is a real character and one of our best blues based guitarists, so make sure you are there early to catch his set. The Status Quo show rolls into the Glasgow Hydro on Friday 4 December 2015 and tickets are now on sale.